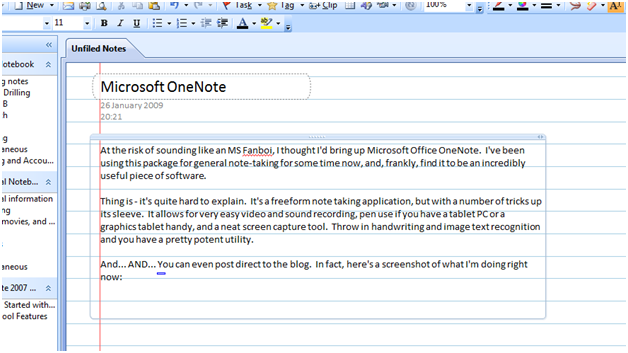 At the risk of sounding like an MS Fanboi, I thought I’d bring up Microsoft Office OneNote. I’ve been using this package for general note-taking for some time now, and I’m finding it to be an incredibly useful piece of software. Thing is – it’s quite hard to explain. It’s a freeform note taking application, but with a number of tricks up its sleeve. It allows for very easy video and sound recording, pen use if you have a tablet PC or a graphics tablet handy, and a neat screen capture tool. Throw in handwriting and image text recognition and you have a pretty potent utility. I can see this as being especially handy for certain collaborative tasks. Total cost? Well it depends, it comes bundled with a lot of versions of Office, but if you don’t have it you can get it from Amazon and the likes. I’ve seen it on offer for £6 for certain academic licences but for most people it’s going to cost between £36 and £72, give or take a bit. I feel strangely apologetic for bigging up some Microsoft Software – funny how that’s happened, they clearly have some failings to address with regards to how people feel about them. I do feel they’re improving on this now, and I have to remember that if it wasn’t for MS I doubt I’d have got into coding as it was their excellent yet affordable BASIC that got me started in 1982. And yes, I am that old!